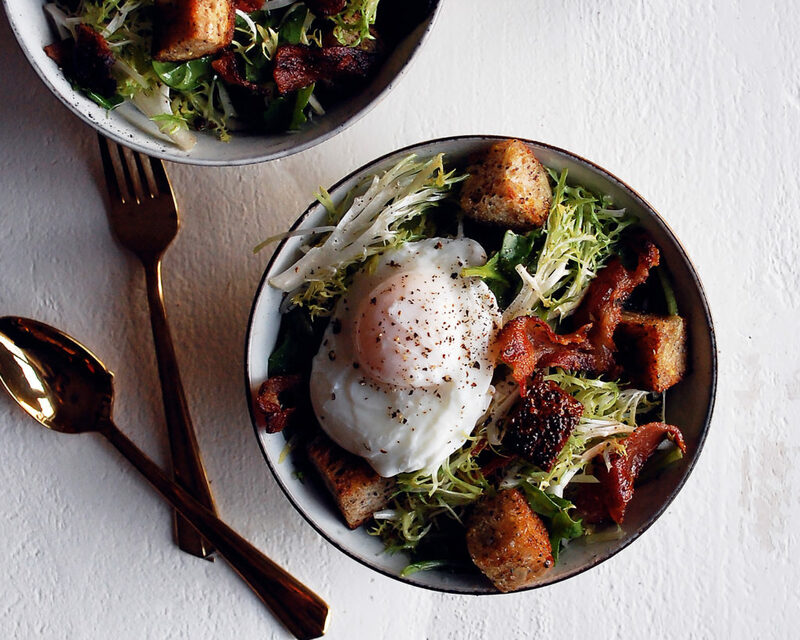 When it comes to simple and delicious salads, this frisee & arugula salad with mustard bacon vinaigrette is tough to beat. This salad is anything but boring. It is packed with flavor, extremely hearty, and kind of addicting. The best part? It is so simple to make. If you like bacon, I don’t think you can find anything better than this. Basically, I rendered some bacon until extra crispy and used the drippings to create a really rich vinaigrette. I also toasted the croutons in the same pan that I cooked the bacon in, so that means extra flavor for the croutons. So basically…a bacon lover’s dream! The vinaigrette has lots of mustard and brown sugar, so it’s sweet and kind of tangy as well. I kept the rest of this salad really simple. 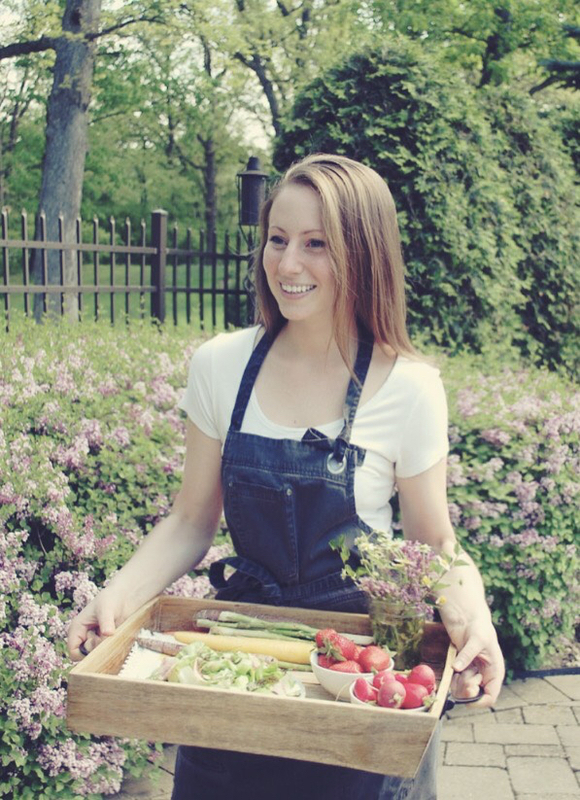 If you haven’t tried frisee, it’s one of my favorite lettuces for a salad because the vinaigrette clings to it really well. It’s got a super interesting texture and makes this salad a lot of fun. And to finish it all off, a perfectly poached egg. 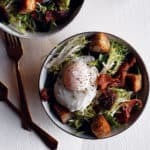 The egg makes this salad a perfect light lunch or even a dinner side salad. I ate it the other night with some sliced, blanched green beans thrown in (you can use whatever vegetables you have on hand or leftover), along with a piece of seared salmon and pesto on the side (and one of these hot chocolate floats for dessert). A meal doesn’t get much better than that! Lay the strips of bacon in a medium sauté pan. Heat the pan over medium heat. Slowly render the bacon until crispy, about 10-12 minutes. Remove the bacon and pour off most of the bacon fat into a small bowl, reserving a bit of fat in the pan to make the croutons. Combine the sherry vinegar, Dijon mustard, and brown sugar in a mixing bowl. Whisk until incorporated. Slowly whisk in 2 tbsp of the bacon fat, and then gradually pour in the safflower oil, whisking continuously. Add the salt. Set the vinaigrette aside until ready to serve. Add a splash of safflower oil to the pan with the bacon fat so that an even layer of oil coats the bottom of the pan. Heat the fats over medium heat. Add the bread cubes and toast until golden and crisp, stirring often. Remove the croutons from the pan and immediately season them with salt. Trim the dark green leaves off of the heads of frisee. You only want to use the light, yellow-green leaves. Once you’ve trimmed the frisee (you will have to trim off a lot), cut the root off and break apart the light, yellow-green leaves. Those will be the leaves you use in the salad. Combine them in a bowl with the arugula. To poach the eggs, bring a small saucepan of water to a simmer. Add a pinch of salt and the white distilled vinegar to the simmering water. Crack one of the eggs into a bowl. Use a fork to make a vortex in the simmering water. Pour the egg into the center of the vortex. Poach the egg for about 4-5 minutes (for a runny yolk), making sure the water stays at a simmer and does not boil. Use a slotted spoon to transfer the egg to a plate lined with paper towels. Repeat this process with the other egg. 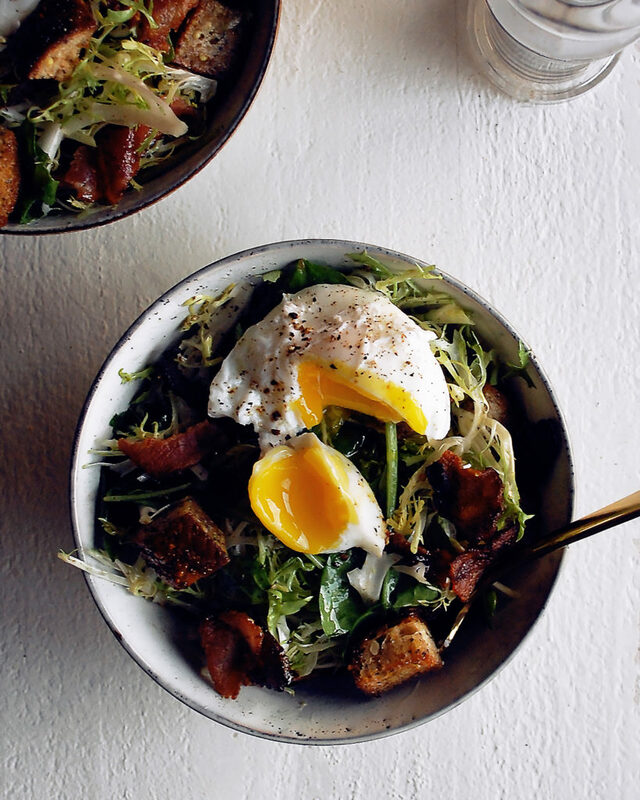 To assemble the salads, toss the frisee and arugula with the mustard bacon vinaigrette. Crumble the bacon into pieces and add that to the bowl. Add the croutons. Toss well. Taste the salad and season with more salt if needed. Plate the salads in bowls or on plates. Top with the poached eggs. Crack black pepper over the top of each salad. 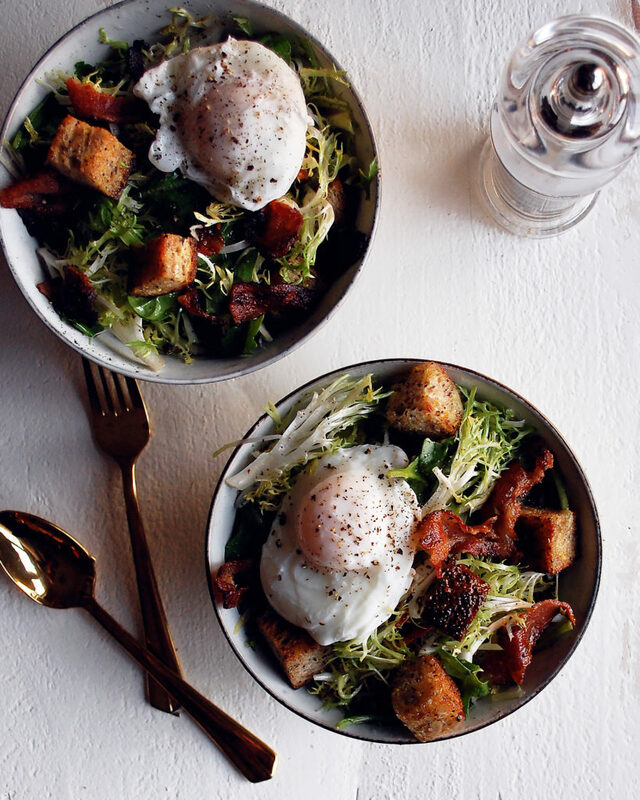 This recipe makes 2 large salads, or 4 smaller side salads (just poach 2 more eggs).